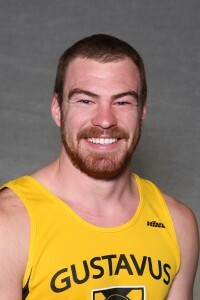 La Crosse, Wis. – Gustavus track and field athlete Josh Owens (Sr., Brooklyn Park, Minn.) placed third in the pole vault competition at the 2013 NCAA Men’s Track and Field Championships held on the campus of UW-La Crosse on Thursday afternoon. Owens capped off his senior spring with a vault of 16-feet 2.25-inches to earn All-America honors. Women’s pole vaulter Ally Voss (Sr., Wausau, Wis.) also competed on Thursday, but did not safely clear a height. For Owens, it is the first time he has garnered All-America honors in outdoor track and field. An indoor All-American in pole vault during the indoor track season earlier this year, Owens adds a second All-America mark to his resume, the first Gustavus pole vaulter to do so in the history of the program. Earlier this winter during the indoor season, he became the first Gustavus All-American in the indoor pole vault after being the first pole vaulter to qualify for the NCAA Championships in 2012, his junior season. With his performance on Thursday, Owens becomes just the second Gustie to attain All-America status in the pole vault in the outdoor season. His third place finish is the higher of the two, following Josh Gysbers who finished seventh in 2003.